The Ekiti State Command of the Federal Road Safety Commission has issued a disclaimer, saying a traffic offender, Adeola Alabi, arrested by Governor Ayo Fayose on Friday was not its staff. Mr. Alabi, earlier identified as an FRSC operative, was accosted and arrested by Mr. Fayose for taking a wrong lane while trying to avoid a failed part of the road in Ikere-Ekiti. However the Ekiti Command of the road safety agency said on Saturday that its records showed Mr. Alabi was not its staff. “The Ekiti Command of FRSC , through the Sector Commander, Ekiti State Command, Mr Stanley Chinedum , wishes to appreciate His Excellency Governor Ayodele Fayose for accosting and eventually arresting a road traffic offender on 15th October, 2015 along Ikere Road Ado Ekiti,” the statement said. “We want to place on record, that the (traffic) offender arrested by the Executive Governor of Ekiti state, His Excellency, Ayodele Fayose, the said Mr Adeola Alabi, is not a staff of Federal Road Safety Commission. 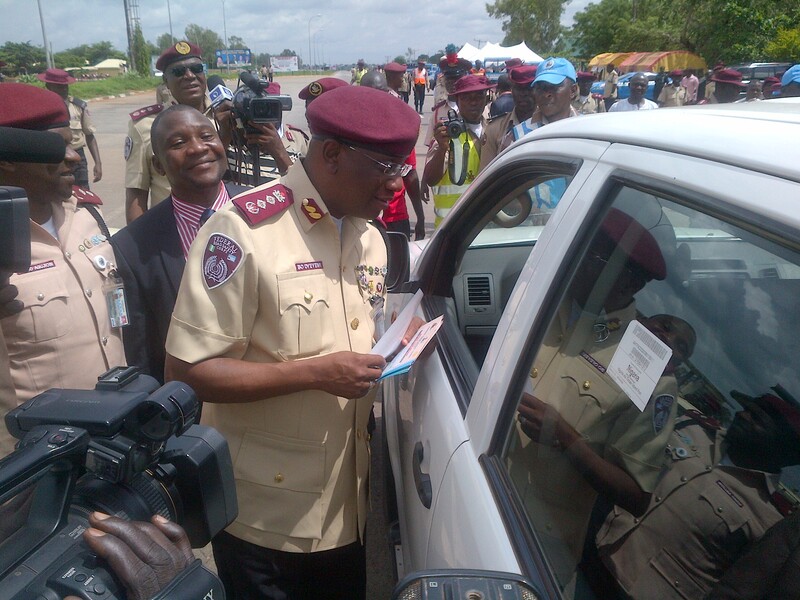 The statement explained that Mr. Alabi could be an impostor or a dismissed operative who was still using FRSC sticker. “We wish to place on record that the said traffic offender, from all available records, is not a staff of FRSC as a regular marshal or a volunteer special marshal. “The said offender could be an impersonator or rather a dismissed special marshal who is still using old sticker of special marshals. Also reacting to the matter, the Head of Media Relations and Strategy at the FRSC headquarters, Bisi Kazeem, said on hearing the report , the Corps Marshal, Boboye Oyeyemi, a disciplinarian , who he said has zero tolerance for indiscipline, ordered an investigation. “To our surprise, it was found out that the said traffic offender was not in the service of the corps either as a regular or special marshal.